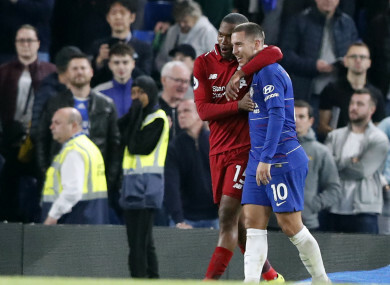 Chelsea's Eden Hazard and Liverpool's Daniel Sturridge after last Saturday's game. IT WAS A sight that just a few months ago would have been unthinkable – Liverpool a goal down in a big game, and Mohamed Salah hauled off by Jurgen Klopp. Klopp got the goal he craved for a 1-1 draw at Chelsea on Saturday that preserved Liverpool’s unbeaten Premier League start, not via Salah’s immediate replacement Xherdan Shaqiri, but another late substitute, Daniel Sturridge. A reborn Sturridge is now Liverpool’s joint top scorer so far this season with four goals despite remaining behind Salah, Roberto Firmino and Sadio Mane in Klopp’s pecking order. That he has remained there to be counted on at all, though, is a huge boost to Klopp’s quest to both go one step further in the Champions League this season and deliver a first-ever Premier League title, 29 years after they last won the English top flight. “Thank God he is here,” said Klopp after Sturridge’s sensational dipping effort from outside the box secured a point at Stamford Bridge. Sturridge has endured an injury-ravaged three years since Klopp took charge. Farmed out to West Brom in January in a bid to refind his form and fitness, Sturridge’s hamstring went again in his third game and he never scored for the Baggies as they were relegated. “He was always a bit unlucky with injuries and stuff like that. That’s how it is, timing in life is pretty important,” added Klopp. Sturridge’s return further strengthens a squad already bolstered by the summer signings of Shaqiri, Naby Keita and Fabinho. That contrasts starkly with the limited options available to Klopp when Salah went off injured just 30 minutes into last season’s Champions League final. “We have a great squad, world-class players, and he’s one of them,” said Virgil van Dijk, whose own £75 million ($98 million) move from Southampton in January has transformed Liverpool’s defence. “Before I arrived at Liverpool, I said he was one of the best strikers in the league and he shows it when he’s fit. Sturridge also played his part in getting his side’s Champions League campaign off on the right foot with the opening goal during a thrilling 3-2 win over Paris Saint-Germain two weeks ago. Sandwiched in the middle of a huge week for Liverpool’s Premier League title challenge with the visit of champions Manchester City to Anfield this weekend, comes another big European night at Napoli tomorrow. However, Klopp now has the luxury of making changes with City in mind without fearing the consequences. After a frustrating few years, the good times are certainly back for Sturridge. Email “Reborn Sturridge an extra weapon in Liverpool's armoury”. Feedback on “Reborn Sturridge an extra weapon in Liverpool's armoury”.